Wellington scored four unanswered goals to come from behind and eventually thrash the Mariners. Phil Moss made a number of changes to the side that were defeated seven days earlier against Adelaide, with Mitch Duke and John Hutchinson returning upfront and in centre midfield respectively, and Matt Sim and Kim Seung-Yong both making their debut. Ernie Merrick made two changes from the capitulation last Sunday against the Heart, bringing Tyler Boyd and Reece Caira into the side at the expense of Jeremy Brockie and Jason Hicks, with Manny Muscat moving from left-back into his natural position in centre midfield. Wellington were the better side throughout. However, they looked vulnerable to counter-attacks in the first half, before a slight tweak of formation gave the defence better protection. The first key issue to address was Wellington’s shape – at times difficult to decipher because of how often the players rotated positions, particularly upfront and on the right, but eventually it became obvious that Boyd was to cover the left when Wellington were defending (perhaps to protect Reece Caira from Storm Roux’s attacking runs), with Muscat and Vince Lia sitting in the centre of midfield. Kenny Cunningham was slightly ahead and to the left of them in a lopsided midfield trio, while Carlos Hernandez and Stijn Huysegems took turns to cover the right flank. With the ball, Wellington rotated fluently, with Cunningham driving forward in support of Hernandez and Huysegems becoming the central striker. 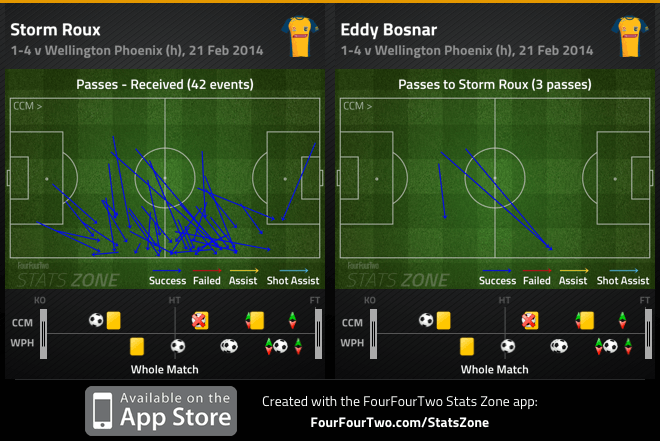 Boyd tended to stay wide and then make an outside-to-in run when the attack moved into the final third. Merrick has constantly encouraged unpredictability this season, and the fact he’s managed to balance that with appropriate defensive cover (in having players taking turns to defend a particular flank) is a key reason for their recent run of form (barring, of course, the 5-0). Meanwhile, the Mariners were their usual 4-2-3-1 – Kim playing off Duke, often starting high up alongside the striker and then darting back to find space between the lines. The key issue of the opening twenty minutes was Wellington’s pressing, specifically high up the pitch at goal-kicks. Like Adelaide last week, the Phoenix were keen to prevent them from playing out from the back, closing down the centre-backs quickly and forcing Liam Reddy to go long. There were a few good moments when Wellington won the ball inside the Mariners half, and could attack quickly towards goal. The by-effect of this, though, was that it opened up space in behind Wellington’s back four, who naturally pushed up to make the side compact. There were a few moments when the Mariners looked threatening when they bypassed Wellington’s press, particularly when Reddy picked out Duke’s run with a remarkably accurate fifty-metre kick. Ibini’s goal wasn’t quite typical of the overall pattern of pressing, considering the turnover came in midfield from Hernandez’s heavy touch, but it was illustrative of where the Mariners were looking most dangerous – breaking in behind the Phoenix defence. 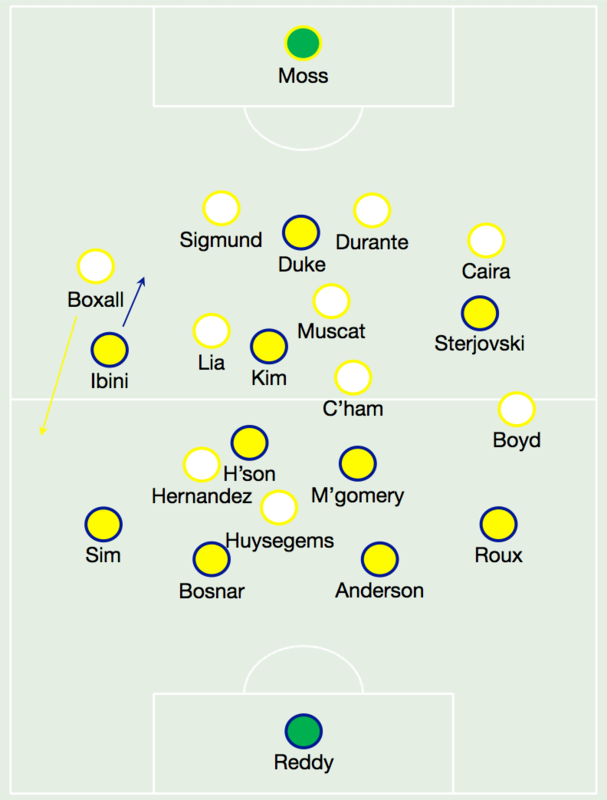 The fact right-back Michael Boxall was so high up the pitch is also significant – considering how Wellington were effectively playing with no-one on that flank in attack, it increased the onus on the full-back to get forward and provide width, inevitably leaving space for Ibini to attack. Also of note is how easily Ben Sigmund was dragged up the pitch – it was very similar to David Williams’ second goal last week, when Sigmund was drawn towards Massimo Murdocca, leaving Andrew Durante in a footrace against Williams. Indeed, Ibini again got in behind down the left a few minutes later, with Sigmund again stuck in no-mans land when moving up the pitch. It might be something future opponents will target. At some point quite shortly after the goal, it appeared the Phoenix had switched to a more defined 4-2-3-1 formation, with Boyd now on the right, Cunningham left and Hernandez alongside Huysegems. Without the ball, the two banks of four were clear, and helped give the side more structure – particularly with two wingers now able to help protect the full-backs, with Boyd doing a good job defensively in front of the previously isolated Boxall. The main problem, now, though, for Wellington, was creating attacks, especially with the Mariners midfield pivot doing a good job stopping Hernandez from getting on the ball. Last week, Patrick Gerhardt was excellent in shielding the playmaker away from goal, pushing him up with the pitch with his close marking and nipping in front of him to win the ball cleanly. This was more of a two-man job here, with Hutchinson and Nick Montgomery both defending proactively against Hernandez, looking to intercept passes into him and covering each other well – when one moved up the pitch, the other dropped in behind to narrow the space between the lines. They also benefitted from an overall slowing of the tempo, with the pace of the game slowing after the goal. That made it easier to track Hernandez as Wellington built attacks from deep positions. Instead, Hernandez’s best moments came when drifting to the right to create little triangles with Boyd and Boxall, but he still had little impact on the first half – certainly not to his usual standard. Merrick continued with the same shape after the break, although it seemed like Cunningham was slightly narrower, perhaps tucking inside to give Wellington an extra man in midfield. Furthermore, Lia seemed keen to stick tight to Hutchinson, to prevent him from turning on the ball and facing play, although the latter still finished as the game’s highest passer. However, barely a minute after the interval, Wellington equalised. It’s difficult to pinpoint this on a particular factor, especially because of how quickly it came after the restart – there was no time for teams to settle. That, in itself, was probably the key issue, because it gave Wellington momentum and confidence. This is, of course, a tactics-based analysis, but that’s the best explanation of Wellington’s excellent second-half display – especially after Glen Moss’s penalty save, which had an obvious galvanising effect on his side. A prominent feature of the second half was Roux’s forward runs from right-back, the New Zealander overlapping energetically and often being the ‘freest’ player in the final third. He scored the decisive goal between these two sides in their last clash at North Sydney Oval a few months back, and again constantly charged forward from full-back to push Caira back towards goal, with Eddy Bosnar picking him out on two occasions with sweeping cross-field balls. Roux was the reason why all of the Mariners most promising moments during the second half came down the right, including the penalty, as well as the Duke chance midway through the half that hit the post. It always felt like the Phoenix would be most dangerous when they got Hernandez on the ball in behind Montgomery and Hutchinson, and the first time this happened, on the hour mark – with Hernandez running at the centre-backs and Huysegems ahead of him arching his run in behind – was the Phoenix’s best chance of the game (at that point in the match), although Huysegems spurned his shot high over the bar. A few minutes later, Hernandez was in a minuscule pocket of space to fire in a spectacular long-range strike. With Cunningham scoring a minute later, the game had been turned on its head – the entire complexion of the tactical battle had changed, and it was now the Mariners chasing the game. Moss’s response to going behind was disappointing. The Caceres change (for Kim) might have been fitness-related, but at 3-1 down, might have been more effective had Caceres moved into deep midfield (where he played last week), thus keeping an extra attacker on the pitch – but then again, Moss might have been concerned about being caught on the counter. As it were, Wellington were now comfortable sitting slightly deeper and hitting the Mariners on the break, making an ambitious double change to introduce Jeremy Brockie and Matthew Ridenton for the two Costa Ricans – the former, of course, scoring the fourth and final goal. 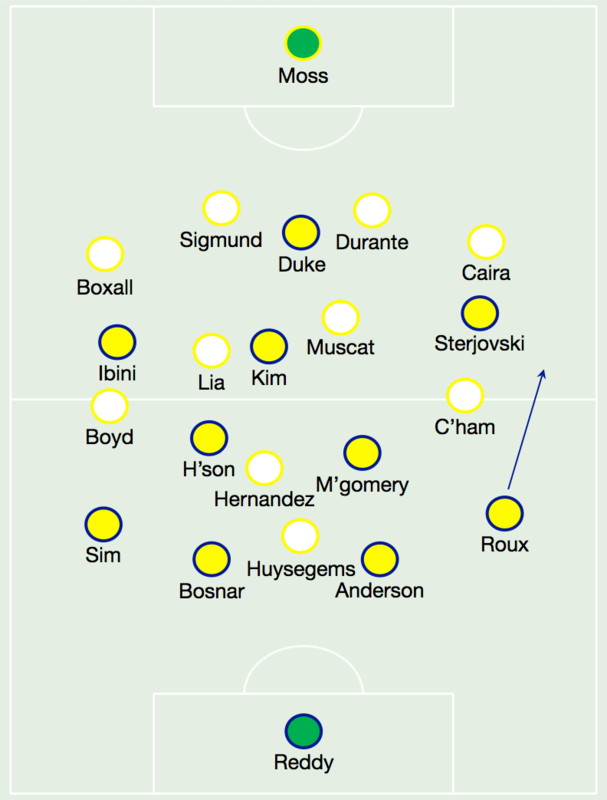 The notion of ‘bringing on another striker even at 3-1 up’ made Merrick’s changes look incredibly attacking, but in reality, they really weren’t – Brockie occupied more or less the same positions as Hernandez, and is probably more defensive aware than the playmaker, making him the ideal player to bring off the bench and increase your striking threat, without sacrificing defensive balance. There’s an important distinction to be made between a player’s nominal position, and what they actually do on the pitch – Hernandez might be classed as a midfielder, but replacing him with a striker didn’t actually make the side that much more attacking. Furthermore, Ridenton was certainly a change designed to shut the game down – he stayed at ‘home’ far more than the man he replaced, Cunningham, and drifted inside to become an extra passing option which helped close the game out. Finally, Moss made a double change with five minutes of regular time remaining, thus accentuating the feeling he didn’t make effective use of his bench – Tom Slater and Glen Trifiro had very little time to influence proceedings, and Moss might have been concerned with damage limitation than chasing the game considering the way he maintained his side’s shape and balance. “I think a lot of people think coaches provide motivational speeches at half-time but what we really did was restructure, only slightly, our midfield,” said Merrick after the match. It’s a fair summary, and Merrick will be particularly delighted with his side’s mental reaction to last week’s sobering defeat, and going behind again here – those sort of intangible factors had a more decisive influence on the match than the tactical battle.